Truffle ~ naughty but nice. I can jump up here and reach onto the table and desk. Lol. Truffle is a Smooth Fox Terrier ~ one of 25 British Native Dog Breeds which are considered vulnerable in that their numbers are worryingly low. Others on the list include the Welsh Terrier, the Dandie Dinmont Terrier, Skye Terrier, Clumber Spaniel, and the breed Best In Show at Crufts 2009 ~ the Sealyham Terrier. NN ~ you requested a picture of Truffle being naughty. Butter wouldnt melt........worth that long trip TT !! Yes, Truffle is keeping me in a state of happiness and permanent exhaustion. Lol. Yes, very much worth the long trip in the snow. Not sure Mr. Claptrap (our chauffeur) has recovered yet. Lol. I've told Truffle he is on your favourites. Yes, there are terrier-type similarities to your handsome Finn. He's so cute TT!!!!! Truffles is going to my favourites! Truffle's favourite places are either sitting on this pouffe cushion. or cuddled up in a dog bed with Conker. Definitely cute but naughty. Lol. Adorable! will be hard to discipline that little monkey! Taking on another Sheltie would have been the 'easy option'. I like the challenge of a Terrier. Lol. I think Truffle read your comment. He has had an especially naughty day. Lol. Lots of years of mischief making ahead of you Truffle. You're a little cutie!Paddy would like to play with you. ~such a sweetie~can't possible be naughty!I'm sure he 's one truffle that won't be fattening TT~ quite the opposite! Yes, this Truffle has been slimming so far ! This evening he was in the bathroom with me while I had a bath and washed my hair. Truffle ended up soaked ! He looks quite cute with foamy shampoo on his nose. He has an intelligent look about him. I think he'll learn very quickly. Looks like he is trying to read your mind with those eyes! Hi Sewingkilla ~ Thank you. Yes, I think Truffle is handsome, but maybe I'm biased. Lol. I'm lucky that Conker is being very patient with Truffle. and then curl up together in a dogbed. Talk about 'butter wouldn't melt'. You haven't got a chance, Terra. Are all of you up there in Lincs so full of mischief and with such a lot of energy ? Lol. if you are can you tell me where to get the energy from?shattered of Swansea! You and Tom Hanks ??? Sorry ~ no energy in my household except for the puppy. Truffle sure is keeping me on my toes. Lol. Truffle really has had a naughty day. Lol. We should be having tea now, but "Trouble" has finally fallen asleep, so I'm sneaking some time on GoY. Lol. Oooh... you cutie Truffle. What joy to have, despite the naughty-ness! Right now Truffle is perched on the pouffe cushion, as in the photo above. Which means he's next to where I sit at the computer. That 'round bed' is actually my pouffe stool, but Truffle has taken it over. Lol. 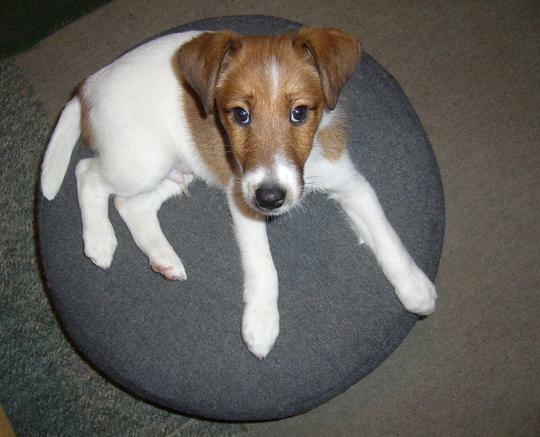 Yes, of the 25 vulnerable British dog breeds, the majority are types of Terrier. Lincs is an attractive part of Britain, even if it does produce over-zealous canines. Lol. Hey Truffles nice to meet you!..you look very proud of yourself sitting there on moms pouff cushion...lol..daring her to say a word with those eyes..and keeping your fur all so perfect while you do it...goodness..Trouble is right...mmm..mmm....mmm hold on to your hat TT...! I hold onto EVERYTHING when Truffle is around ! You'll never out fox the fox, never out fox the fox ! He looks great, I think he will soon be the star of the shows. how did I miss this cute little dog? he is a smasher. Hi Dotty ~ thank you. Looks as if he's been a naughty boy - his coat is wonderful. Truffle says he is pleased to meet SarahC, and Jeremy, Bear, Harold and Serious Herman. Harvey the Boxer playing feather games ? I'd send Conker the Sheltie over to help tidy up, but he has his paws full supervising Truffle's mischief. Lol. Truffle went for his first inoculation today. In typical terrier fashion, he enjoyed his trip to the vet, and was totally unaware that he'd been given an injection. Lol. What news of Honey, Geri, Chloe and Tom ? Oh TT, he is a handsome boyo! He is gorgeous TT - and looks so innocent on this picture. I didnt realise the numbers for his breed are low - I think we should all get one, lol. Yes, good idea to all get a Truffle. Lol. Then you can all be totally exhausted like I am right now. Lol. It will get easier .... eventually, lol. They never seem to sleep either, do they! ~as well as two boxers?would be interesting! Sorry, hope that hasn't confused Tonycigar ! Lol. An absolutely wonderful little guy there toonie!! My puppy knows how to keep me on my toes. Lol. Hey there toonie I'm doing good and yes I did see the photo! Nice job on the Wellie Olympics big job there but someone has to do it! Awwww TT what a lovely little boy you have. Hows all the house training going, bet you have eyes in the back of your head lol. I remember when Pepsi was that young, some of the best and worst days ive had with her lol. Truffle is doing fine thanks. Growing fast ! Yes, I bet you can remember Pepsi at that age, into everything ! Truffle is certainly still mischievous ! or is it only slightly maybe? and Truffles I wish you were mine. a fine dog for all to see.